Are you bringing a watercraft to the Thompson Boat Rally? Have you registered yet? The non-judged gathering takes place Saturday 22 June 2013 at Marinette, WI. Only 4 weeks away until boats and canoes and duckboats start arriving at Nestegg Marine. Get signed up today. You must pre-register for the Saturday evening picnic no later than Tuesday 18 June 2013. No exceptions. This will be another fun and rewarding event. Plenty of time to go for boat rides, get to know other classic boat enthusiasts, learn about restoration materials and procedures, drink beer and eat cheese and brats! I depart two weeks from today to get to the Thompson Boat Rally. Only 14 boats pre-registered. That's very sad. The lowest number we have had in all past years was 32. The highest was 62. If you are on the fence, get off it and sign up. If your registration form is sitting on the desk awaiting to get mailed, get it in the mail. 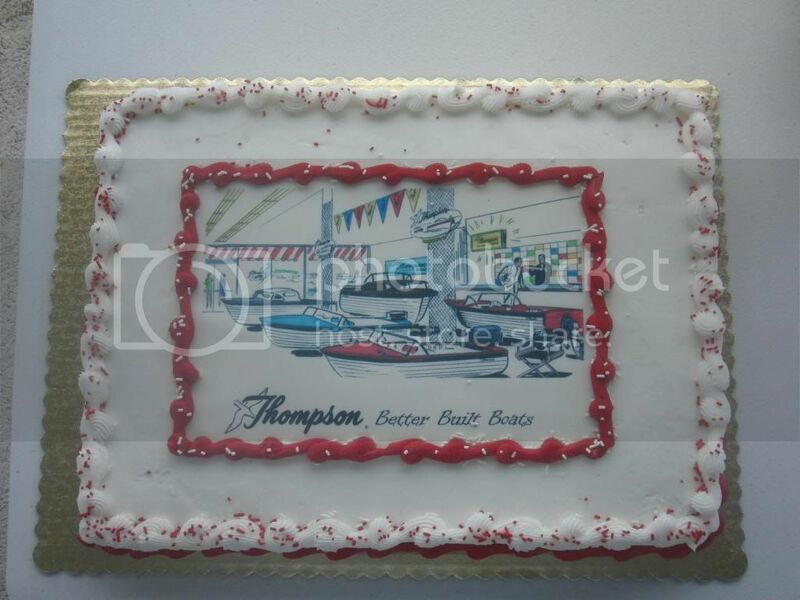 TWO weeks until the Thompson Boat Rally. Received your confirmation letter in the mail today Andreas. This is our first trip to the rally. Our Cruisers Inc. is 50 this year, looking forward to the trip. Hope to see more than 14 boats. Come on guys, how about a rally for the rally. 20 watercraft now. One person is bringing 4! I guess I'll try to drag my parent's boat too, so that brings the count up to 21. Really sorry we can't make it this year. We had a great time the last 2 that we were at. I hope others decide to come at the last minute. Even if your boat isn't a show piece, bring it along no matter the the condition. You will get a lot more out of the show just in ideas for yours, or compliments for what you have already done. It is always a good time. One boat just dropped out, so we're back to 20. One more boat registration received. Back up to 21 ! Five boats registered today (4 from one person). Inching up there. Now at 26. 30 boats now!!! I bet five or more will just show up at the Rally Saturday morning without pre-registering. Drives me crazy - difficult to plan - but such is life. If you want to attend the picnic Saturday evening you MUST pre-register. NO exceptions. I must know by Wednesday 19 June 2013 at 17:00 - NO EXCEPTIONS. It's a little too far from Seattle to Wisconsin for me to attend, but I hope everyone takes lots of pictures and posts them here! 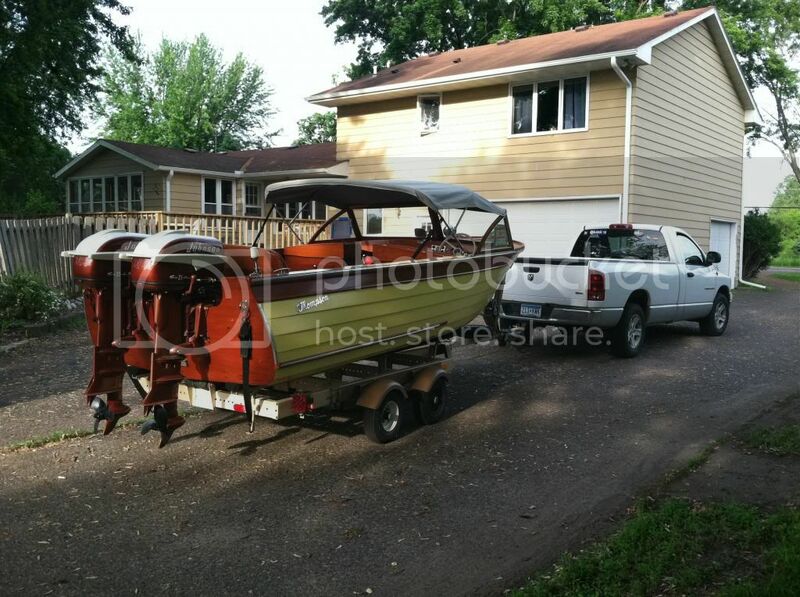 Hittin the road for my journey to Marinette and the Thompson Boat Rally. And NO, I am not driving with the convertible top up. It is securely down. C-ya in Marinette and here's crossing our fingers for NO rain! 35 watercraft were on display at the THOMSPON A\NTIQUE & CLASSIC BOAT RALLY. 5 pre-registered boats cancelled a day or two before the event and one just never showed up. Great turn out considering is was cool and windy. No boat parade sadly, since it was very windy and rough. I only took pictures of the cake and I can't find my camera to get them downloaded. I hope some others that attended took photos and are able to get them here. A great event and lots of wonderful people. THANKS everyone for attending and especially those that brought boats. Many thanks to Mary & Bill Hermanson for getting the Saturday picnic lined up. Yummy food!!! Nestegg Marine deserves a special shout out for hosting us and doing tons of behind the scenes things that make holding the Rally possible. I returned home to storm damage. Lots of branches down (no big deal); fence knocked over (no big deal)\; and a flooded basement. Water must have been 6 to 8 inches deep before the sump pumps caught up. Yuck. Thompson Boat Rally sweet tooth medication! 1964 T & T Boats, Inc. Breakers with John Rhude and his daughter Anika pictured. 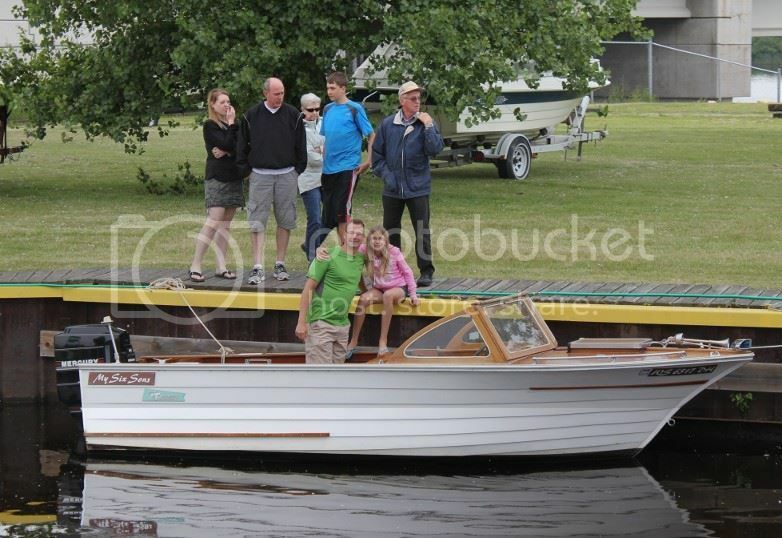 They are the second and third generation family members to use the boat. 16 pictures of the 2013 Thompson Boat Rally have been posted to the facebook page for the Thompson Antique & Classic Boat Rally. Thanks to Lori and Tom Ross for sharing their photos.